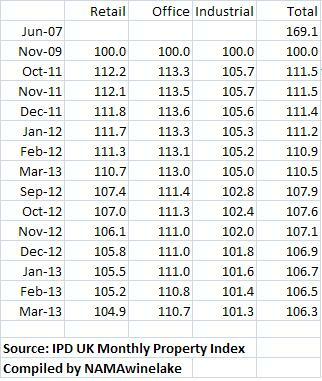 This week saw the publication of the March 2013 IPD Monthly Property Index for the UK. The IPD (Investment Property Database) index is the only UK commercial index referenced by NAMA’s Long Term Economic Value Regulations (Schedule 2) and is used to help calculate the performance of NAMA’s “key markets data” shown at the top of this page. The Index shows that capital values fell by 0.2% in March 2013, which follows declines averaging 0.3% per month since December 2011. Prices reached a peak in the UK in June 2007 and fell steadily until August 2009 when a rally started. Prices then increased by 15% in the year to August 2010 but have since been declining and are down by 3.8% in the last 12 months. Overall since NAMA’s Valuation Date of 30th November, 2009 prices have increased by 6.3%. Commercial prices in the UK are now 37.1% off their peak in June 2007. The NWL index falls to 778.1 which means that NAMA needs to see a blended increase of 28.5% in property prices across its portfolio to break even at a gross profit level (taking into account the fact that subordinated bonds will not need be honoured if NAMA makes a loss). The table below shows the three subsectors in UK commercial property with an index for all three at NAMA’s valuation date of 30th November 2009 of 100. Offices have been relatively buoyant whereas industrial premises like factories and warehouses have been relatively flat. The UK economy is suffering difficulties almost every bit as challenging as those in the EuroZone and Ireland. Sure, they have their own currency and they’ve printed GBP 300bn of it in an economy with a GDP of 1.5tn, to help inflate their problems away. And yet they appear poised for a triple dip recession. On 20th March 2013, the UK’s independent Office for Budget Responsibility published its latest fiscal outlook which forecasts GDP for 2013-2017 at 0.6%, 1.8%, 2.3%, 2.7% and 2.8% (but as with all economic forecasts in the long term, all forecasters forecast a peachy outlook!). Deficit:GDP is forecast for 2013-2017 as 6.8%, 6.0%, 5.2%, 3.5% and 2.3%. Debt:GDP is forecast in 2013-2017 at 94.9%, 98.6%, 100.8%, 100.8% and 99.4%. Inflation is forecast for 2013-2017 at 2.8%, 2.4%, 2.1%, 2.0% and 2.0%. It expects residential prices to increase 0.9%, 1.9%. 3.6%, 4.0% and 4.0% in 2013-2017 and commercial property to change -0.1%, 2.6%, 3.6%, 3.8% and 3.4%.